Closing Statement | Back Page | Style Weekly - Richmond, VA local news, arts, and events. When state Sen. Henry L. Marsh III unceremoniously shuttered the historic law firm a few weeks back, he pulled the shades on Richmond’s most consequential legal association of the 20th century. Hill, Tucker & Marsh was neither Richmond’s largest law firm nor its most prestigious. It didn’t maintain a stately address on Main Street or command a sweeping, boardroom view of the James River. At times, the firm or its various antecedents, dating back to Oliver W. Hill’s arrival in Richmond in 1939, struggled to pay the bills. And its partners knew their share of disappointment and tragedy, even while they scored soaring legal victories. For all the outward modesty, however, when state Sen. Henry L. Marsh III unceremoniously shuttered the historic law firm a few weeks back, he pulled the shades on Richmond’s most consequential legal association of the 20th century. The most noted of the men whose lives entwined with the group in one era or another — Presidential Medal of Freedom recipient Hill; former chief judge of the U.S. Court of Appeals for the District of Columbia, Spottswood W. Robinson III; astute trial lawyer Martin A. Martin; the passionate and engaging Samuel W. Tucker; and Richmond’s former mayor, Marsh — played pivotal roles in defrocking Jim Crow. Collectively they helped shape the way youth are educated, neighborhoods formed, voters approved, corporate hiring conducted, and seating on buses and trains arranged, all with an eye to eliminating race as a determining factor in American life. The group evolved through various law firm names and configurations. The final incarnation, Hill, Tucker & Marsh, endured for some 45 years. But before that, there was Hill & Robinson; Hill, Martin & Robinson; Hill, Martin & Olphin; and Tucker & Marsh — changing faces and letterheads, but a single united purpose of dismantling a segregated society and establishing equal rights for all. The constant, except for a brief period in the early 1960s when he held a federal post, was Hill, a towering, charismatic presence who died in 2007 at age 100. Ironically it was failure that pointed Hill toward Richmond and a rendezvous with history. Hoping to establish a legal practice in Roanoke in the midst of the Depression, he fell short. “Continue to love me as I love you and we will make it o.k. in time. I won’t be defunct always,” he promised his bride of three months, Bernie, by letter, in December 1934. But by mid-1936, he was back in Washington, working as a temporary waiter on a riverboat on the Potomac and trying to regroup. His fledgling association with the National Organization for the Advancement of Colored People helped lead him to a Virginia murder trial and, eventually, to a solo law practice in Richmond in 1939. Within 18 months, Hill’s assistance in cementing a landmark victory equalizing teachers’ salaries for blacks and whites in Norfolk established him as the go-to lawyer for the NAACP in Virginia. Two years later, facing induction into the Army, Hill pushed a reluctant Robinson to take the Virginia bar exam, a hurdle that the Richmond native and Howard University law professor had skirted out of nervousness, despite graduating in 1939 with the then-highest scholastic average in the history of the law school. A few days after Hill left for basic training in June 1943, his grateful secretary informed Bernie Hill that Robinson had passed the exam and the fledgling law firm could survive. “I feel much better now since Spot can be sure of taking over,” she wrote. Bernie Hill wired orchids to Robinson in celebration. During the next dozen years, Hill and Robinson — joined by Martin in 1944 — formed the most significant civil rights practice south of Washington. 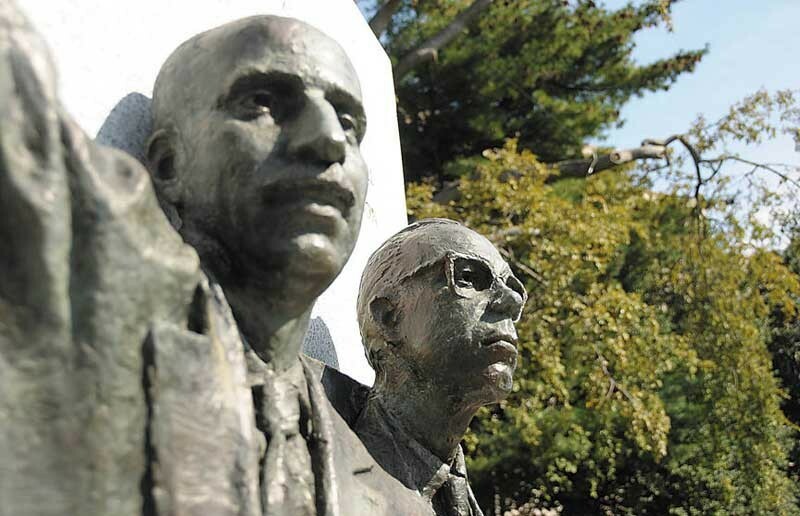 Marshaling a cadre of NAACP lawyers statewide, the Richmond trio logged thousands of miles and filed dozens of lawsuits, attacking unequal salaries, facilities and transportation in black and white schools. The equalization campaign, ultimately the most extensive in any Southern state, proved instrumental in establishing that “separate, but equal” was a mockery. When the NAACP’s national strategy switched in 1950 to an all-out attack on segregation, Hill and Robinson were at the forefront. They launched the Prince Edward County case that entwined with four others in Brown v. Board of Education, striking down segregated schools. Nor were the school cases their only claim to fame. Morgan v. Commonwealth of Virginia led the U.S. Supreme Court in 1946 to forbid segregated interstate transportation. The action occurred a decade before Rosa Parks’ defiance of segregated bus seating in Montgomery, Ala., made her a national icon. Throughout the 1950s and ’60s, while career changes shuffled the cast and youngsters such as Marsh arrived, the group remained in the forefront of efforts to deliver on the promise of the Brown decision, to resist efforts by Southern legislators to cripple the NAACP, and to ferret out other types of discrimination. In 1968 Green v. County School Board of New Kent County, often described as the most important school desegregation case post-Brown, squashed local efforts to avoid genuine integration. Last week the Franklin Street offices of Hill, Tucker & Marsh stood empty. Marsh, 78, was traveling outside the country. Nothing remained but scattered debris on the floor and a series of framed documents, including the Declaration of Independence and the Emancipation Proclamation, visible through a glass doorway. Margaret Edds, a former political and editorial writer for The Virginian-Pilot, is researching a book on Oliver Hill and Spottswood Robinson. Opinions expressed are those of the writer and not necessarily those of Style Weekly.